One of the favorite cake among all varieties in all age group. I have used Betty Crocker cake mix hence its quick to bake. 1. Bake the cake and cool it completely. 2. Whipping cream should be at room temperature. This helps in spreading the cream easily and gives a smooth finish. 3. On the cake is completely cooled remove the upper brown hard layer of the cake. 4. Now you will get flat layer of the cake. 5. Now cut the cake horizontally into 2 equal sizes. 6. Take the lower slice and spread the pineapple juice generously. Now spread the whipped cream generously. Place few pineapple chunks and few cherry slices. 7. Now place second layer on the top. Now generously spread the pineapple juice and icing with a knife spread the icing with a smooth layer. In between immerse the knife in hot water and continue icing. 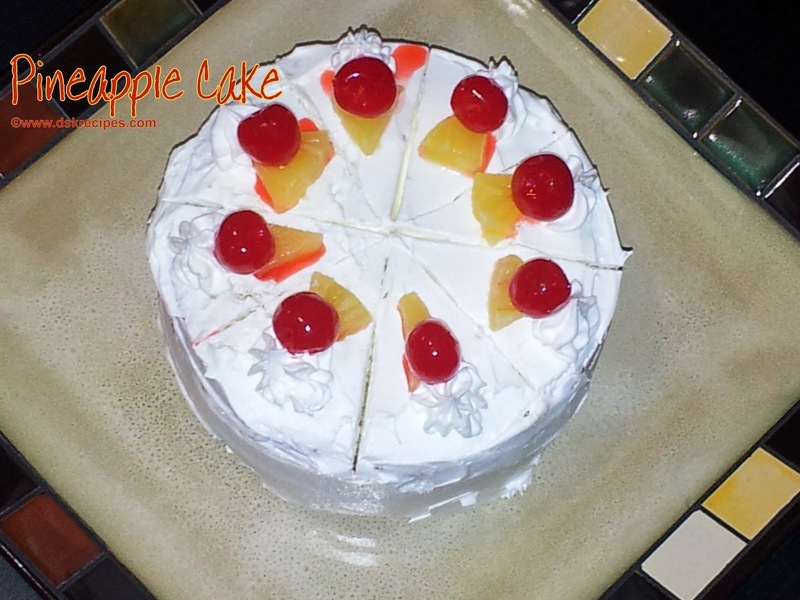 As the knife become warm this help's in spreading icing smoothly and finishing becomes easier. 8. Once the icing is done decorate cake as you like. 9. Refrigerate cake for few hours for setting the cake. Serve. beautifully made.looks amazing. thanks for hosting this food guide.